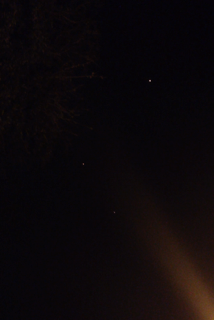 My husband and I (with my children) went out front of our house to use our last few fireworks, and when we looked up we saw these red/orange orb like UFO's darting across the sky. They moved too smoothly and fast to be a plane and the light seemed to make up the whole craft. At first we thought they were special fireworks, but more and more kept appearing we saw about ten (10) to (15) of them and they all seemed to be going to the same place. I have attached some photos we took.